Hilton Head Island, June 15-16, 2018 | This year's June Calendar of SC Events is brought to you by Hilton Head's annual Juneteenth Celebration, featuring special performances by Marlena Smalls and the Hallelujah Singers, as well as Lowcountry legends Ranky Tanky and Candice Woodson. The featured film is The Language You Cry In. Enjoy a fish dinner and West African-style drum circle, along with live gospel music, spirituals, storytellers, and re-enactors. 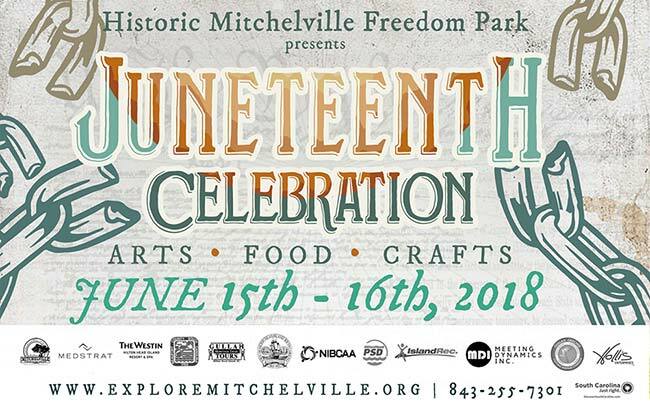 Explore Mitchelville's Reconstruction era through art, food, music, and live demonstrations. See more great South Carolina events coming up in June. FRONT COVER OF South Carolina's Sacred Spaces, a new book by Bill Fitzpatrick. All proceeds benefit the preservation of endangered churches in our state. A few years back, a random stranger called me and said something like, "I just visited every single South Carolina site listed in the National Register of Historic Places. Would SCIWAY like to publish my photos?" Being at the time blithely unaware of the depth and breadth of this offer – there were well over a thousand of those suckers! – I shrugged and answered, "Sure." Thus began my friendship with Bill Fitzpatrick, a software engineer from Taylors whose calm demeanor is no match for the irrepressible twinkle in his eyes. Bill had recently sold his company, and the contract included a non-compete clause, which meant he had some time to kill before he could go back to work. 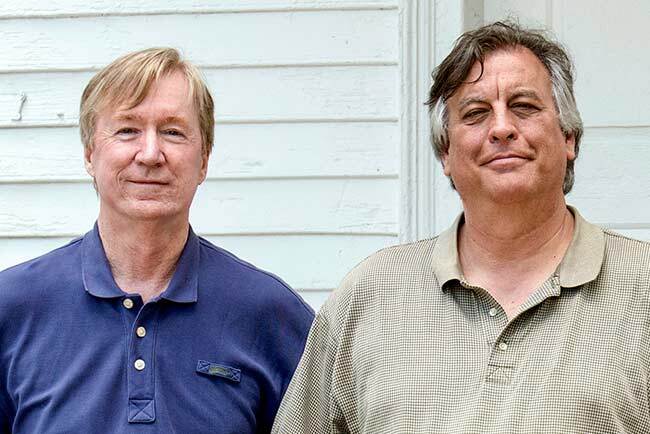 PARTNERS IN PRESERVATION — Bill Fitzpatrick (left) and Mike Bedenbaugh (right) stand outside Saint John's Lutheran Church in the small Newberry County community of Pomaria. For reasons that remain unclear to me (probably because I'm not nearly as noble and would prefer to spend my sabbatical at a beach), Bill decided to use his unexpected holiday to document South Carolina's history. From lonely mill villages to the forsaken ruins of plantations and forts, no part of our past proved too humble for Bill's lens. He traversed the 46 counties for months on end, and despite the fact that he had no formal training in photography, captured images of an astounding 1,400 landmarks with almost haunting grace. 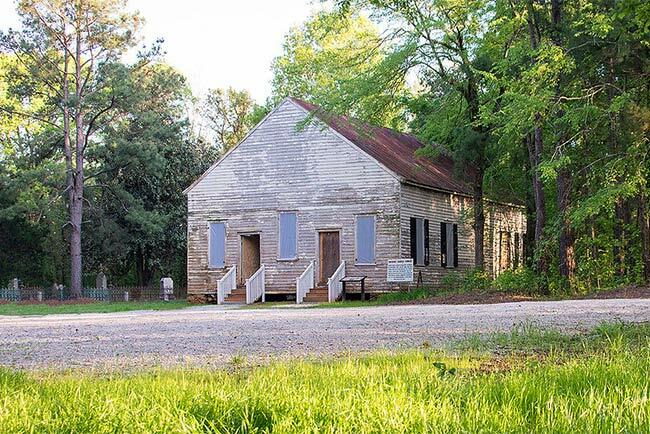 A SUCCESS STORY — Horn Creek Baptist Church in Edgefield was near ruin just a few short years ago. Thanks to a small team of volunteers, the church has made a remarkable recovery. This accomplishment bored Bill quickly, of course. He is what one might call a "ball of fire," or as I like to put it, "a hurricane masquerading as a human being." His contribution to our state's historical record was not enough for him. He wanted to affect actual change. 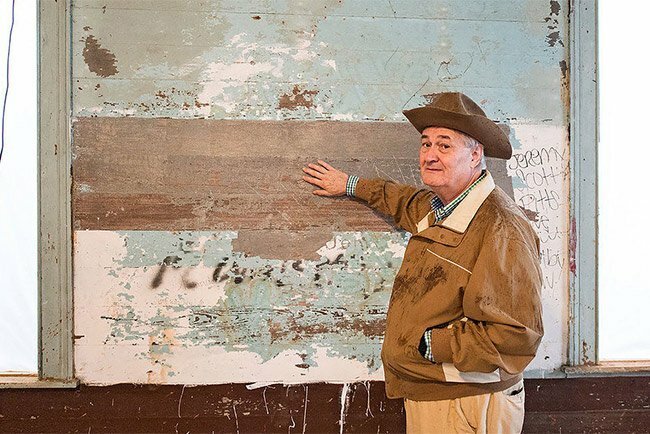 Speaking to Bill today, he explains that during his journey, he was blessed to meet many of the caretakers of these forgotten landmarks, and their devotion to preserving the past resonated deeply within him. Especially meaningful, in his mind, were the plights of our endangered churches, which are often looked after by descendants of the families who founded them. These ordinary citizens lack funds and generally perform all work themselves. Their thankless tasks include everything from tending tombstones to mowing graveyards, from repairing rooves to boarding up windows broken in a storm. MR. BARNEY LAMAR was hired as Horn Creek's caretaker by the Edgefield County Historical Society. It is rare for rural churches to have a dedicated caretaker. Mr. Lamar has worked on high-level restorations throughout his life, including chapels in Europe and the Biltmore Estate in Asheville. Determined to make a difference and assist them in their efforts, Bill went home to the Upstate and began to assemble a book featuring his photos. Looking back, Bill says with a laugh, "I didn't know what to do with it! I knew it was beautiful and interesting, but I was still unsure as to my next step. Should I self-publish, as I have done in the past? Should I take it to the University of South Carolina Press and hope they would publish my work? "And then I thought of Preservation South Carolina, a non-profit organization well known for its great results in saving our state's at-risk buildings. What if I simply gave them the rights to the book, provided that all profits be placed in a special fund to be used for the preservation of our state's sacred spaces?" 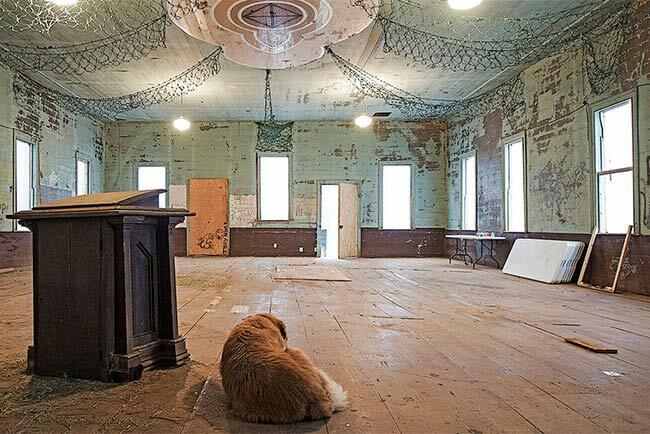 IN WHAT MAY be my favorite photo ever, a dog peacefully watches over the church. When Bill first photographed Horn Creek in 2012, he "didn't give it much chance of surviving another decade." Bill then met with Mike Bedenbaugh, the organization's Executive Director, in Spartanburg, and says, "In less than fifteen minutes, we shook hands. We are now actively involved with several projects, as well as promoting the sale of the book." Bill's stunning 256-page coffee-table book is now available for pre-order via Preservation South Carolina's website, and it will be delivered this fall, just in time for the holidays. Having been lucky enough to see an advance copy, I feel fortunate not only to be able to introduce it to you, but also to recommend it with my whole heart. My only caveat would be that if you order one as a gift for someone else, be sure to order one for yourself too. Otherwise you won't want to give it away! 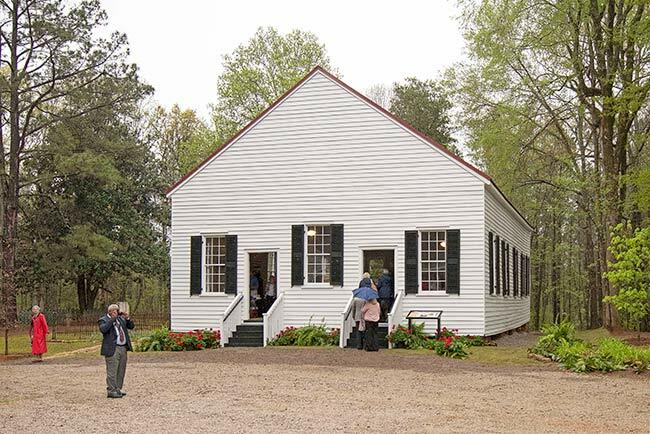 HORN CREEK BAPTIST has been almost fully restored, but what's better than a church that's safe? A church that's used! The group above gathered together in April 2018. In the years since my first conversation with Bill, I have watched him grow into one of the most determined leaders of South Carolina's preservation movement. His effectiveness, it seems to me, comes not from his love of history so much as from his willingness to squander himself – and his art – on its behalf. It is rare that we get a chance to help save our state's history in a way that requires so little effort, and affords such joy. Please squander (and spoil!) yourself a little, and purchase a copy of Bill's book today. 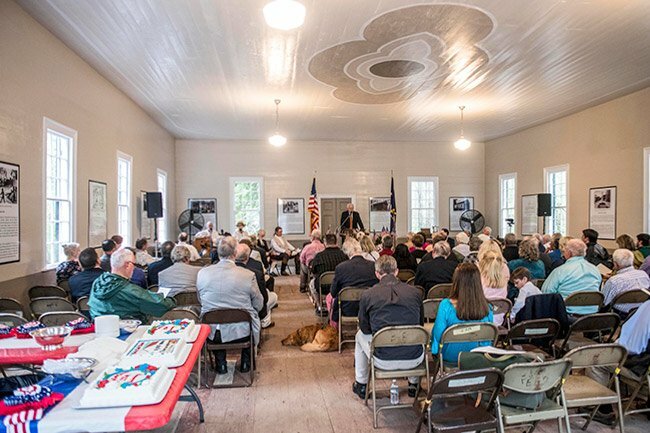 With every sale, Preservation South Carolina will be that much closer to protecting the sacred spaces we hold dear. HORN CREEK BAPTIST, post-restoration. What a difference love and a little money make! 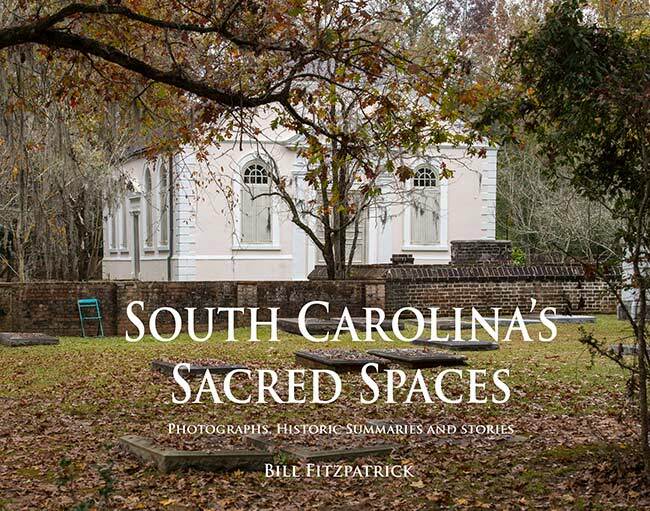 Please help save more churches with your purchase of South Carolina's Sacred Spaces by Bill Fitzpatrick.